Simple cycle time metrics can drive valuable conversations and changes. Ultimate Software is a leading provider of Global HR and Payroll software. The company has been ranked on "Fortune's 25 Best Companies to Work For" list for the past 5 years and was named "#1 Best Company to Work For in Tech" for 2016. Ultimate Software has a vibrant "People First" culture. Every layer of management from the CEO to the Team Leads encourages and empowers employees to be innovative and creative when approaching their daily tasks. The company takes great care of their employees, and the motto "People First" applies not only to the users of their products but also to the environment provided to Ultimate's employees. After failed attempts to do Scrum at scale, Ultimate finally settled on Kanban as its scaled methodology of choice. Kanban provided a framework that went hand in hand with the company’s culture of autonomy. Teams were able to define its own process and apply policies that were specific to their own context. The results of this autonomy of process, which was an extension of the cultural values of Ultimate Software, as you are about to see, speak for themselves. After struggling with Scrum for a while, Ultimate attempted a "reboot" by retraining the leads of the teams in Scrum principles. This time, however, the training was supplemented with practices from Lean and XP. To our dismay, this reboot still did not provide the hyper-productivity that the company was seeking. At this point, the leadership in Product Development started to experiment with Kanban. As our first shot with Kanban, we selected the infrastructure team as that team was particularly problematic. Without explicitly changing methodologies from Scrum to Kanban, we started visualizing their work on a board. We also started limiting the number of work items that each member of the team had in progress. The team still performed the scrum ceremonies for a while before eventually deciding to abandon sprint planning and sprint reviews. Limiting WIP and visualizing work had an almost immediate effect on the team. The team was able to keep up with the tickets that were coming their way and were able to stay on track. As the team achieved more by working on less, they fully adopted the principles of flow. Given our success, we repeated this approach with another core Product Development team. This again, turned out to be a success. It wasn’t long before all teams were moved to a Kanban system. The impact of this move was felt immediately. As Kanban has no explicit limit on team size, it allowed us to collapse business lines into large teams to allow for lower transaction costs. During the initial period of formation of these larger teams, the larger group behaved more like a team of teams. The smaller teams had formed strong bonds and sub-cultures that took some time to become integral parts of a larger team culture. Once the teams started rowing in the same direction, the transitions to the large teams started to bear fruit. The adoption of Kanban also marked the first time that we started to see the hyper-productivity that Agile promised. Kanban principles and flow metrics helped the teams begin to achieve the productivity results that we had been looking for since the start of our Agile journey. These results are discussed in detail in Section 3. It was late 2014 when we renewed our focus on Kanban. We retrained every team in the organization on the importance of Kanban principles in combination with flow metrics. Every team in development attended a 2 day course where the principles of flow and Kanban were laid out. The teams left the training having created the map of their processes together. We focused on the benefits of explicitly mapping out and visualizing process, limiting WIP and managing for flow. This fell in line with our theme of autonomy for teams and individuals. Every member of the team was involved in the exercise of defining the process, deciding the WIP limits and laying out the policies that the team would adhere to. The teams started paying attention to basic flow metrics: Work In Progress (WIP), Cycle Time, and Throughput. If you are not familiar with these concepts, then we highly recommend reading the book "Actionable Agile Metrics for Predictability" by Daniel Vacanti (see references below). The results were far better than we expected and are detailed in the individual team cases outlined below. The ACES team started in 2013 as a 16-member Scrum team whose sole responsibility was the development of a new Pay Calculation Engine. In early days of Scrum, the team was widely considered successful because it delivered a consistent velocity. Upon examining the team’s data in the light of flow metrics, however, we discovered that there were extreme inefficiencies in its development process. When remedied, the gained efficiencies resulted in higher productivity and greater predictability. The left chart in Figure 1 above shows that when the team was using Scrum practices, 85% of its stories took 30 days or less to complete. A 35-day Cycle Time in and of itself is not necessarily bad unless you put it in the context of the fact that the team was running 14-day sprints. Further, 50% of the stories completed in that same time frame took 15 days or less to complete. What that means is that stories that started at the beginning of a sprint only had about a 50% chance of completing within that same sprint. This is not the picture of predictability that the Scrum velocity metrics would lead us to believe. After taking note of the Scatterplot, the team began to dive into the reasons why stories were taking so long to complete. What they discovered was that most long-lived stories were sitting in the "Ready for QA" column for extended periods of time. That was a problem because "Ready for QA" is a queuing column where stories just sit and are not actively worked on. These "waiting" columns are the low hanging fruit of process improvement and so it was "Ready for QA" that the team decided to attack first by putting a WIP limit of 5 on that column. The team also chose to prioritize concentrating on work that has been in progress the longest to achieve a consistent rate of finishing work rather than allowing stories to age indefinitely. This decision meant that developers could not pull in new work if there were 5 or more things waiting for QA. They would instead have to go help with the testing of the product. This implication was discussed and accepted by the team as the appropriate behavior to ensure the flow of work. The result of these policy changes were almost immediate. From that point forward (see the right chart in Figure 2) the team was able to get 85% of their stories done in 14 days or less. Throughput for ACES also increased from 1.07 stories per day to 1.41 stories per day. This was achieved in the same time period when the team size was reduced to half of the original size. These modifications did not include changing the size of stories or working overtime. The team continued to hone their flow-focused process by further lowering the WIP limit on the Ready for QA column and encouraging the various disciplines on the team to help each other out in order to make sure none of the items on the board age beyond their 85th percentile. This meant more testing was being done by developers and at times more development work was being done by testers. Eventually the lines between the roles became very blurred. This helped the team became a very well-functioning and close knit group. They understood the demands of different roles better and solved problems as a collective. Responsible for core payroll functionality in a context characterized by frequent interrupts of urgent customer requests. The Payroll team maintains and develops the core payroll capabilities for Ultimate Software’s flagship product, Ultipro. This is a 30-person team formed in 2009 by combining three separate smaller Scrum teams. It should be noted that this team had a consistent history of being interrupted by urgent customer issues (think about how upset you might be if your paycheck was not calculated correctly or distributed on time). After Kanban re-training in 2015, the Payroll team immediately changed the way they worked. One dramatic change they made was to lower their WIP limits on their board below the total number of people on the team. The idea behind this change was to promote pairing and remove knowledge silos. This also left slack in the system to allow for the team to deal with emergency customer issues when they came up. The adoption of such a strict WIP limit meant more pairing on the less commonly understood areas of the system. Some of the individuals on the team reluctantly agreed to the change and tried it out for themselves. This forced them to adopt practices like test first, pairing and cross discipline collaboration. The result of embracing these policies and practices was immediately visible in how long it was taking the team to complete their stories. 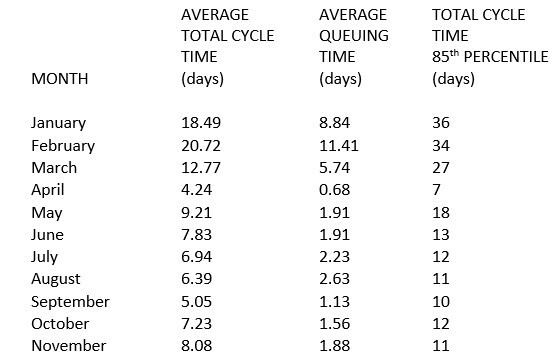 The amount of time stories spent in queuing states decreased dramatically over time and as a result the Cycle Times for the team went through a dramatic decrease as well. The table below shows the faster Cycle Times since the team’s training at the end of March 2015. Notice from Figure 2 that the net active time that the team was spending on stories did not change. By limiting their WIP, the team was able to cut down the time the story was just sitting on the board. As the team got more efficient in the use of a Kanban system and started tweaking their process policies, they were able to gain greater consistency in story completion times (at the 85th percentile-again, see Figure 2). The teams taking control of their own processes was a test of one of the main underpinnings of the cultural norms of Ultimate Software - Autonomy. In the case of Payroll and almost every other team in development, the managers took a step back to act as coaches, so that the team can have the autonomy to adjust the way they work. The teams, for the most part, did not see this as an extra burden, but instead relished the increased flexibility. The greater predictability of Cycle Times had two immediate effects. First, the team was able to deliver value to the customers faster and more regularly. Second, when an emergency issue did come up, the team could ask the question of "Can this wait until we finish one of the items we are currently working on?". As work items were getting done faster, there was a regular stream of people freeing up to pick up the next item. With a team member freeing up on a daily basis, the team could ask the requesting party to hold off for a couple of hours or till the next morning. In case of absolute emergencies though, the paired team members could break the pairs in order to deal with the escalations. The same question could not be asked if the team was taking upwards of 20 days on average to finish work items. "At first we laughed at the thought of intentionally limiting our Work In Progress and simplifying our Kanban board. We truly believed that this approach would "never work for our team". That was before April’s Kanban training. We transformed our board, changed the format of our Standup and implemented sensible WIP limits and the way we work changed forever. Before Kanban 2.0, we thought we must be "slacking" if we had fewer than 40 stories on the board. Today we rarely break 20. Much to our surprise we discovered that the ideas from our training really do work for us! …This lets us adjust our feature work more rapidly and deliver higher quality features. As a manager, it’s now possible for me see to all of the team’s work at a glance and pinpoint areas of concern before catastrophe strikes! Finally, having stable cycle-time and Throughput data allows us to truly predict our capabilities for future release planning and emergency requests from Production. Today we laugh, or cry, when we think about the way we worked before!" The improvements outlined above were not limited to just these two teams. In fact, the advances shown here were largely exhibited by all teams across the entire development organization. 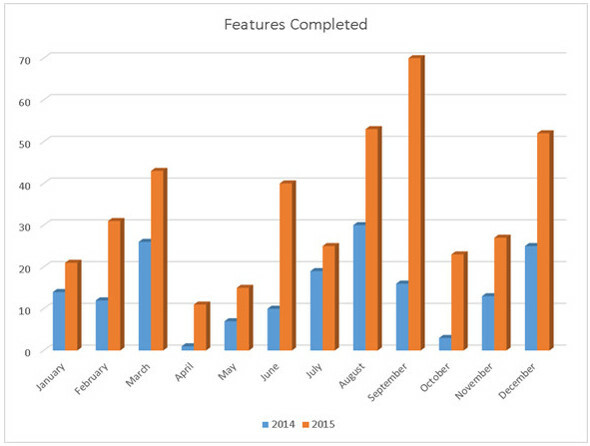 There was a marked increase in both the number of stories completed and the number of features completed between 2014 and 2015. The shorter story Cycle Times translated into faster completion of features. Faster completion of features translated into a dramatic increase in the total number of features delivered to customers: from 176 in 2014 to 411 in 2015. Looking at the month over month comparisons, every month in 2015 was more productive than the same month in 2014. Ultimate Software’s culture played a great part in aiding these transformations. The autonomy provided to employees and management trusting that employees will do the right thing for the business was a catalyst in the adoption of these practices. The team members rarely displayed a "not my job" attitude and responded to management’s trust by donning different hats to ensure flow of value through the development pipeline. These organization wide improvements had the ultimate effect of streamlining our release planning process. That Cycle Times were so predictable and Throughput was so stable that it allowed us to experiment with more sophisticated planning techniques-the most important of which was Monte Carlo Simulation. MCS is particularly useful to figure out the probability of meeting a certain delivery date given the number of stories needed to be done by that date. The simulations, run at different points in the release can tell us if the team is falling behind on its commitments, is on track to meet its date, or can pull more work into the release. As opposed to getting a singular result by using averages, Monte Carlo provides a wider range of possible results with varying degrees of confidence. This gives the team the ability to commit at whichever level of confidence the team and the product manager agree to. Since the method uses team’s past data, the team has the ability to both influence the forecasts and determine the confidence level at which they want to make a commitment. At Ultimate, each team’s release is independent which means that each team has its own release dates. Using the story data from the teams as outlined in Section 3, and feeding that data into an MCS, we have put together a release dashboard that tracks each team’s progress toward its target dates. 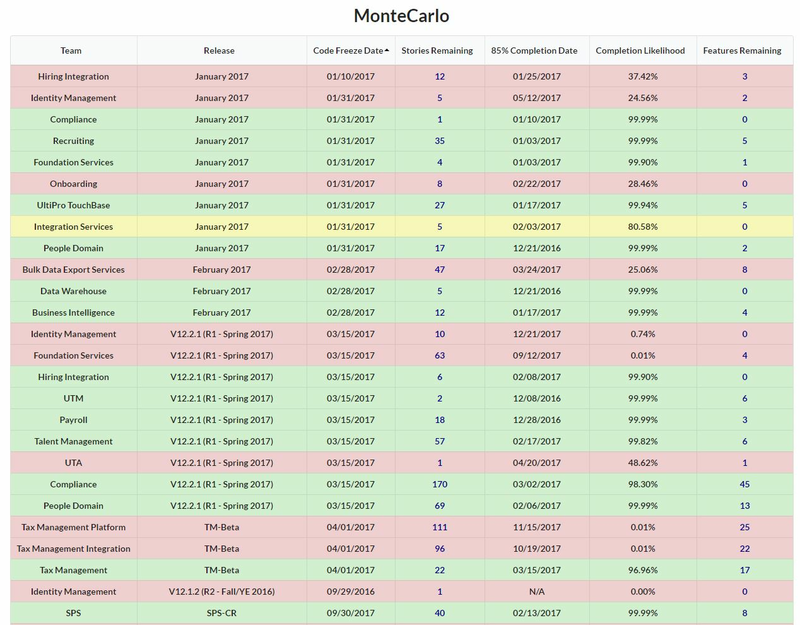 Below is a screenshot of the Monte Carlo release tracking dashboard that gets updated every hour each day to reflect the completion likelihood for every release currently in progress. The information here also includes the code freeze date for the release, stories remaining to be closed and the date where we can say with 85 percent confidence that the team will be done with the stories in the release. Usually the teams commit to higher levels of confidence. This means that they are committing to fewer stories that they would have committed to had they used an average to make the commitment. Once the initial commitment has been met, the Monte Carlo predictions start telling us how likely is the team to complete the new work that they have pulled in. This empowers the team to commit to new work when they have capacity to do so. As the date for the release gets closer the possibility of missing the release (if the team has slowed down for any reason), increases. Each team figures out the point at which they are in the red zone and starts having conversations about risk mitigation at that point. This dashboard gives us a single place where the organization can look and see the risk of any given release completing on time. This dashboard is of such importance to our Agile practice at scale, that it becomes the focal point of an organization-wide daily tactical meeting called the Daily Product Review. The Daily Product Review (DPR) is Ultimate Software’s successor to the Scrum of Scrums. The DPR, which is a 15-minute daily meeting, brings together the key metrics of Cycle Time and release completion likelihood in one place to provide the overall scorecard for the development organization. It reinforces the metrics and practices we care about on a daily basis. Ultimate has a large development organization where teams run autonomously and (for the most part) independently. The DPR helps the leads of the teams come together to reaffirm that we are all part of a greater whole. Below are some pieces of the DPR board that help us reinforce and scale these practices. Or some combination of parts or all of the above. Another part of the DPR board is the individual Team Updates tiles. These tiles are color coded green, yellow or red based on the number of stories that the team has above the 95th percentile of the Cycle Times for their stories. The team can add notes to their tiles with the dependencies that are causing the stories to take a long time and the course of action they are taking to address the long running stories. The assumption here is that anything exceeding the 95th percentile is probably something out of the team’s control. As can be seen in the updates from the Payroll team below, there first story is blocked due to an external dependency and the second was blocked due to the lack of proper builds. The manager of the development team which is blocked, usually takes the lead in trying to resolve the issue. With a shared understanding of how important the resolution of these blockages is to the predictability of the teams, managers of the teams causing the blockage, work to resolve these through the course of the day. Adopting Agile techniques has provided the benefits of increased productivity and predictability. For an overall perspective though, Ultimate Software is in a waterfall sandwich. The Agile development organization sits in the middle of traditional sales and support organizations and traditional deployment and activation organizations. As a part of the next evolution of Agile and flow based thinking at Ultimate Software, we are expanding out to organizations that flank development. Ultimate’s culture that encourages managers and employees to experiment and make the right decisions for Ultimate, has aided greatly in spreading the principles outside of core development. Departments within Ultimate Software have started pulling the services of the Agile coaches within development to help them with the same principles. While the upstream expansion helps us get better at the creation of value, expanding downstream to deployment and activations is where we can improve the delivery of value to our customers. As Ultimate Software has started working on new products, we have pulled deployment activities onto the teams. For our older products, we have always done a handoff to our Sass deployment group. We broke the “over the wall” mentality by embedding deployment engineers on the development teams for new products and helping them educate the rest of the team on maintaining their own deployment pipelines. The teams were initially concerned about taking on the additional responsibility. Those fears have abated as the teams have realized the support that is available to them form the rest of the organization. This practice has also greatly reduced the occurrences of production environment surprises. Since the teams help build the environments that they deploy code to, the code does not behave unexpectedly when pushed to production. These teams are supported by three groups outside of Product Engineering. Groups that manage the Build and Deployment infrastructure for the products being developed have also adopted Kanban principles and started measuring cycle times for making infrastructure available to teams. They have established SLAs for different types of requests and have become predictable with these metrics. We can now see a feature make its journey all the way from a request generated in Sales to Product Strategy, to Development and finally to Production. Once we are able to track the progress of a feature in this manner, we can start identifying opportunities for improvement in the inception-to-delivery cycle. The organization as a whole can identify where features get stuck and apply our understanding of flow to eliminate the time features have to wait in queues across the entire organization. Another aspect that is downstream from the development and even the deployment group is activations. Activations is the group that helps a new customer go live with Ultimate Software’s products. The activation process can take up to a year and can involve multiple teams. Every day that a customer is in the activation phase, Ultimate Software is investing time, but not receiving full revenue. This is an area that can use the benefits that the Development Organization has gained from flow and Agile practices. Development has started working with Activations to share the principles and practices that have made a positive difference in the predictability and speed of completion for deliverables. Moving Kanban outside the lines is the next large step for Ultimate Software. We have already started moving in this direction through our work with support and deployment teams. Ultimate continues to scale out its Agile implementation without using any established frameworks. Setting up the right channels of communication and visualizing our work in a manner that is easily understood by all is at the crux of how Ultimate has been able to successfully adopt and evolve Agile at scale. We have been able to recognize these benefits much more quickly and at a fraction of the cost of a more traditional scaled Agile implementation. The practice outlined here are ones which any organization-regardless of size-can easily pick up and see immediate results. We’d like to acknowledge Rafael Santos and Fernando Trigoso who while no longer at Ultimate Software played key roles in our early agile and Kanban success. Steve Reid has been at Ultimate Software for over 16 years developing large scale Human Capital Management systems. In his current role he’s a Fellow responsible for Lean Agile thinking. Prior to this, he served various management positions including VP, Software Engineering and Director, Software Engineering. Daniel Vacanti has been working in the software industry for over 20 years. In 2006 he helped to develop the Kanban Method for knowledge work and has been helping teams all over the world to implement flow principles ever since. His book “Actionable Agile Metrics for Predictability” was published in 2015 and is the definitive guide for using flow metrics in an Agile context. Prateek Singh has been leading and working on agile teams for the over 10 years. Starting with XP, then Scrum and now working in a Kanban system, Prateek is currently involved in conducting training and coaching for teams regarding Kanban and Lean principles at Ultimate Software.